As an Entrepreneur you've been attending "business school" as long as you've been in business. It's simply an unavoidable part of the process. Now, you deserve to be honored and recognized for the good work you have done, the success you have already achieved, and the many lessons you've learned along the road. 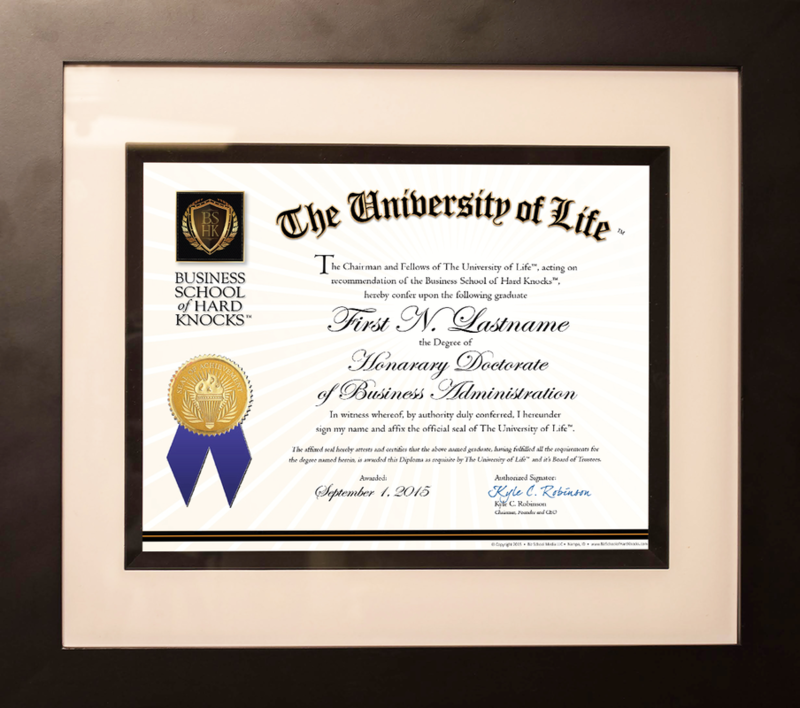 Imagine having your own professionally framed "Honorary Doctorate" or "Honorary Masters" degree in the Business School of Hard Knocks hanging on your office wall! Your employees, colleagues and friends will be impressed, and It will create instant respect and credibility for what you have already accomplished, You will be a member of a Very Exclusive Club of Entrepreneurs and business owners who have achieved... and been recognized for the success they have rightfully earned. Accredited by the the "University of Life"
The true value of Entrepreneurs, and the contribution they make to our society, culture and the American way of life is something that is both overlooked and under-appreciated. The fact remains, the vast majority of jobs produced where free enterprise reigns are created by small business owners, or Entrepreneurs ...just like you! This is the impact and value that Entrepreneurs bring to our economy and to the American way of life. You know and value this real life experience as an Entrepreneur through the day-in and day-out struggle of working through the challenges of building your own dream and vision. We call it The University of Life. Whether you have a formal degree from a Technical School, College or University, or not, is completely irrelevant to your business life experience today. And, even though a few Colleges and Universities today offer courses, and in some cases even a formal degree in Entrepreneurism, the hard reality is there is no school or training that can fully prepare you for the challenges you will face on a day-to-day basis when you made the decision to start your own business and become an Entrepreneur. It is our belief that Entrepreneurs of all stripes and colors are members of a very special club of individuals who understand what it takes to be in pursuit of your dream and business success - however YOU define that success! This is the process by which your Honorary Degree is accredited -- not by a traditional standard of learning and memorizing irrelevant facts and figures that most will never use in real life, not to mention the lack of ANY practical, real-life experience in the process. No indeed! Entrepreneurs earn their Honorary Degree only through real-life experience. ​That's why we call it the Business School of Hard Knocks, earned and accredited through your very own University of Life. As Entrepreneurs know, real life experience is a most unforgiving school-master. And thus, our Honorary Degree Award is earned and accredited through the true and real process of your blood, sweat and tears. to a Very Exclusive Club Indeed!